Rebelscum.com: We Want to Give You A Rancho Obi-Wan Membership Next! We Want to Give You A Rancho Obi-Wan Membership Next! The gift is an annual membership to Rancho Obi-Wan, the nonprofit museum that houses the world’s largest collection of Star Wars memorabilia. 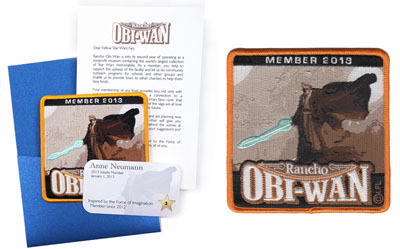 The 2013 Rancho Obi-Wan Membership Welcome Kit includes a welcome letter from Steve Sansweet, owner of the collection and chairman of the museum, an exclusive 2013 member patch with art especially commissioned for Rancho Obi-Wan by Dark Horse cover artist Benjamin Carré, and a personalized 2013 membership card hand-signed on the back by Steve. This Initiate Membership also includes email newsletters and updates, access to a members-only online store with exclusive merchandise, and a discount towards a higher-level membership with tour options. Tours of Rancho Obi-Wan, about a 50 minute drive north of San Francisco, last about three hours, are personally guided by Steve, and are filled with anecdotes and behind-the-scenes stories. The museum serves the public through the collection, conservation, exhibition and interpretation of Star Wars memorabilia and artifacts, using the collection to provide meaningful educational, aesthetic, intellectual and cultural experiences to a wide array of audiences. Paid memberships and contributions further Rancho Obi-Wan’s mission to inspire through Star Wars. Besides the web site, you can see frequent updates by friending Rancho Obi-Wan's Facebook page. All you have to do for your chance to win is leave a contributing comment on any of the stories or newer photo archive galleries on our site. Every time you join the conversation, you'll have a shot at taking one of this stunning set home, but remember we're looking for comments with substance so 'fail' or 'LOL' style posts won't make the cut. The winner will be randomly selected and notified in the thread with their comment. We will publish notifications when we select winners and the winners will have a seven days (one week) to reply back to us with their shipping information. If they do not contact us within the given period, a new winner will be selected, so make sure to keep your eyes on our front page and ensure your Disqus settings allow you to receive reply notifications. The Rancho Obi-Wan Membership Kit will be shipped directly from Rancho Obi-Wan, and as such, it is important to know that any International winner may have to pay duty and VAT charges.